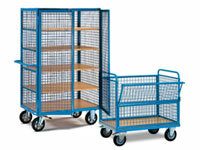 What is the purpose of the Heavy Duty Mesh Box Cart 750kg? 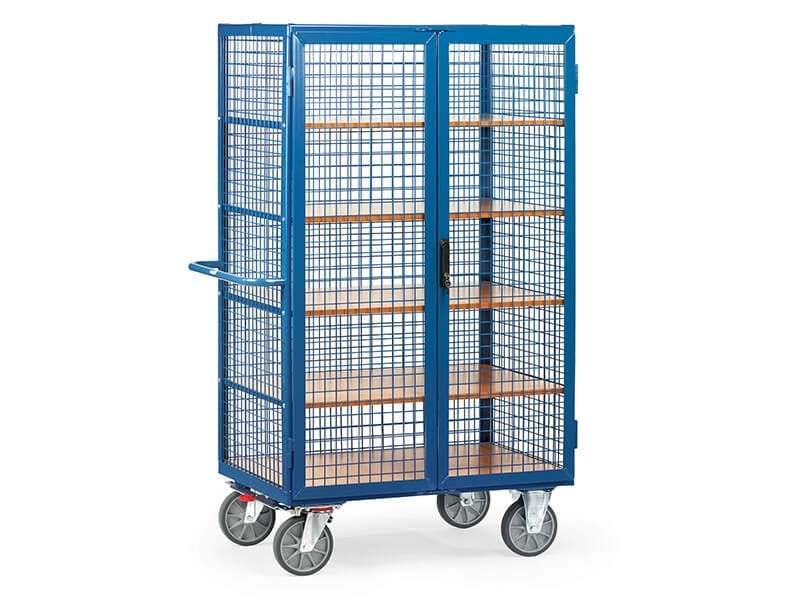 The Heavy Duty Mesh Box Cart is designed to help warehouse or sorting facility staff separate packages or materials for upcoming tasks. Four convenient adjustable shelves can be set to different heights for optimal storage capacity. The fixed shelf heights are 582mm, 882mm, 1182mm, and 1482mm. The base platform is set at a height of 292mm. The cart can carry a maximum weight of 750 kg and is constructed with rugged angled steel. Another feature is the 4 wheel system that enables the unit to be moved with ease. Two of the wheels can be set with a brake for stationary tasks. There is a handle located on the side for pushing or pulling. There are lockable doors so expensive, or delicate items can be secured safely. The cart is available in the colour blue. Where can this Shelved Cart be used? The cart can be used in warehouses, offices, or factories. The handy design enables warehouses to load up supplies that need to be shipped out or delivered. The shelved truck can be used for tools or materials for different tasks. Offices can separate materials and use the unit as a closet for additional space. Factories can place hazardous material on the cart and store in a central location for optimal use. Who might use this Mesh Cart? The heavy duty trolley can be used by a plethora of different staff members. The lockable cart can be used as a storing area for supplies. 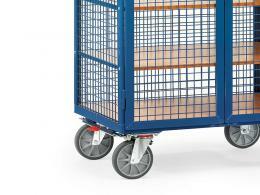 The cart can be easily moved and utilised for different tasks or delivering packages. Warehouse personnel will find the item useful for separating orders for shipments or daily tasks. The cart is manufactured to the highest standards. The product is made with excellent materials and is highly durable under normal work conditions.